Ships 5-7 Business days after you order. Only thing I can say is- These pedals are awesome!! I ordered the endurance series with the black rubber nubs on them. I had a mechanic friend install them for me. They look spectacular and the grip is so much better than stock pedals. They are custom order and take a few weeks to get, but you won't be disappointed when you do. Also, thanks for great service PYFC. We are now offering two styles of pedals - racing and endurance. Racing pedals are set up to be light and thin for sport and performance use. Ideal for the race track, autocross, drifting, or any other competition, or just for a sporty street or show look. Our endurance pedals are 50% thicker and heavier than the racing pedals and are meant for street and show use. 4 Piece Set fits manual transmission cars: 1 Foot Rest (Dead Pedal), 1 Clutch Pedal, 1 Brake Pedal, and 1 Gas Pedal. 3 Piece Set fits automatic transmission cars: 1 Foot Rest (Dead Pedal), 1 Brake Pedal, and 1 Gas Pedal. Gas pedal that is designed specifically for heel/toe shifting. Notice how wide that gas pedal is on the bottom! 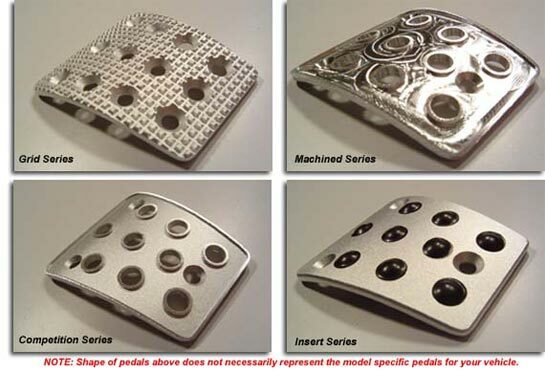 "Anti-slip" raised edges on all pedals designed to provide a much greater grip than factory or other aftermarket pedals. 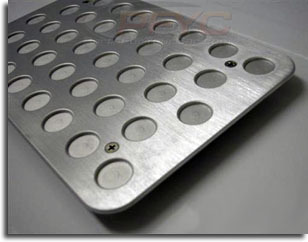 CNC machined from aircraft quality aluminum. Contoured to match OEM pedal curvature for a secure fit. Pedals are directly attached via countersunk machine screws. No cheap "bracket" attachments. Pedals will not damage footwear when rubbed behind the pedals. If you have "bracket" attached pedals then you know what we are talking about. NOTE: These are pedal sets are covers that mount over your existing pedals. They do not replace your pedals completely. Are your floor mats worn at the heel? As you know, nice floor mats can cost hundreds of dollars. Simply shampoo your mats then install our heel guard for a brand new look! The show quality heel guard is done in an exclusive Matte (pictured below) or Brushed Finish. They are smooth and will not scratch dress shoes whatsoever. Measures 10.5" x 6.5".